As we are primarily a website hosting provider we limit email sending to 150 emails per hour. If you wish to send out a mailing list to individuals that agree to receive that email you can use several scripts that support email throttling to do so and meet this requirement. 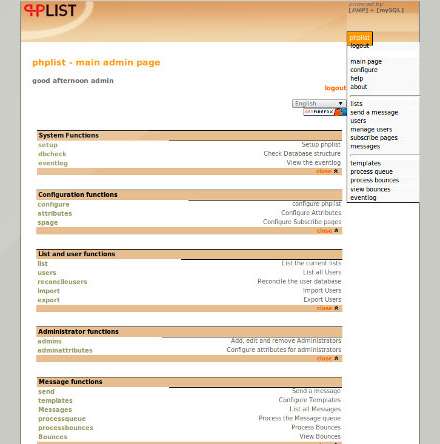 To limit the amount of email PHPList sends per hour locate your config file for your PHPList installation. 2. Download this file to your PC/Mac. 3. Make a backup of this file just in case. 4. Edit the file in a text or html editor of your choice. 5. Locate the section called as "batch processing". These settings tell phplist to send 100 mails per hour. Why only 100 when there is a 150 email limit? This allows you breathing room for bounce back emails and other emails coming through. 7. Save the file and ftp it back to its original location. Now you should be able to send emails without any bounces and not overloading the server.